This marks the second annual Global AI Talent Report, published by Element AI’s CEO and co-founder, JF Gagné. The report analyzed the demographics of AI professionals, as well as the estimated size and the migration of the worldwide AI talent pool in 2018. The report surveyed the authors and publications at the top 21 scientific, AI conferences in 2018 and conducted a survey of LinkedIn profiles in order to better understand the different skill sets in regions worldwide. It came to the conclusion that, worldwide, women are underrepresented in the field, accounting for 18 percent of AI conference authors. The gender ratio varied from country to country, with Spain topping the gender ratio list at 26 percent women. Canada ranked lower than average, with women representing just 14 percent of Canadian conference authors. The lowest ranked country was Japan, where women accounted for just 9 percent of Japanese conference authors. Canada ranks among one of the top countries for training and employing AI talent. Canada, along with the US, China, the UK, and Germany accounts for 72 percent of authors publishing related research. The US still ranks the highest for employment of AI professionals, with a staggering 46 percent of people in the AI industry working for a US-based employer. This is followed by China, which accounted for 11 percent, and the UK, which accounted for seven percent. Canada, Germany, and Japan all accounted for four percent of the sample. However, the report was also found that Canada had a higher percentage of outbound researchers than inbound. The talent report analyzed where researchers moved for work after completing PhDs, and Canada saw talent inflow of 33 percent compared to a talent outflow of 45 percent. The high percentage of both inflow and outflow workers indicates that Canada attracts workers, but loses more researchers to other countries. A 2019 Hays Canada Salary Guide released in January found that Canada’s current skills shortage has a negative impact on productivity. On the other hand, Canadian tech companies are also stepping up their game to recruit abroad. 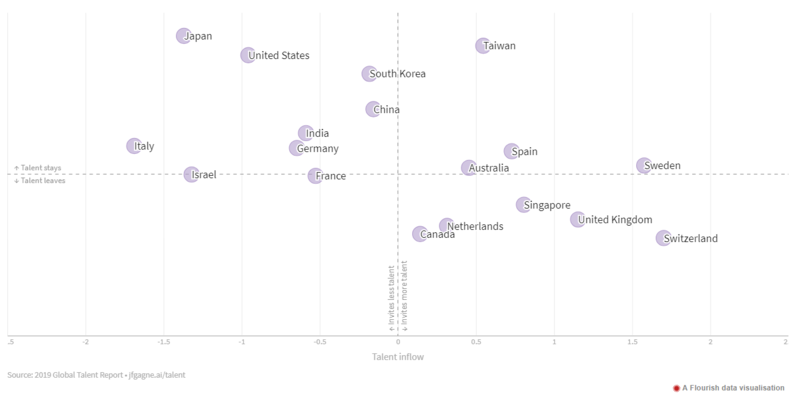 In comparison, the US sees less talent inflow and less talent outflow on average, in proportion to the country’s overall talent pool. The US sees talent inflow of 21 percent and a talent outflow of 18 percent. This signifies the stability of its AI talent pool when measured against other countries. Canada was also among the top five countries leading high-impact research. The total number of authors worldwide at top conferences was 22,400, up 19 percent from 2017. Of these, about 18 percent, or 4,000 people, are doing research that has had a notable impact on the worldwide AI industry. The list was topped by the US with 1,095 researchers, with Canada filling out the bottom of the top five list, with a much smaller 45 researchers. According to the report, there are clues that indicate the Canadian AI ecosystem is larger than the data suggests, and is growing fast. In 2018, the report found the number of active AI-related startups in Canada rose 28 percent from the year prior, representing almost 650 AI startups across the country. Canada has also already seen notable investments in the AI ecosystem this year, with the University of Toronto receiving a historic $100 million to build an AI innovation centre. In February, the Alberta government also announced a $100 million investment to attract more AI companies to Alberta. The Element AI report also noted an increasing number of international AI labs opening in Canada’s major cities, including Toronto, Montreal, Vancouver, Edmonton, and Waterloo. 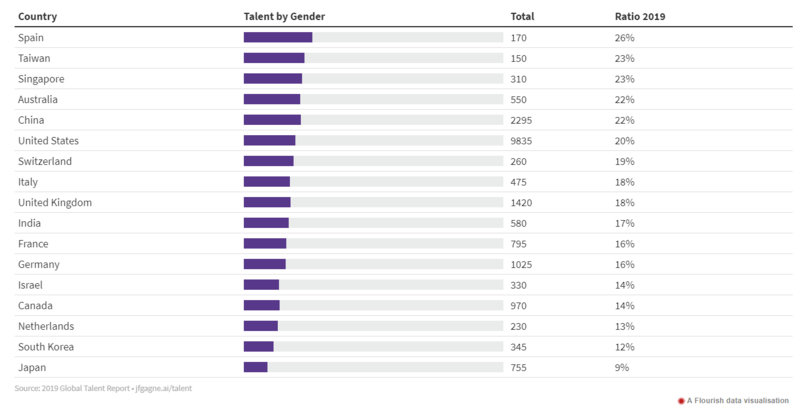 “This year’s findings show a dramatic increase over last year’s global talent pool, which we think reflects the major investments in AI that have been made by both the public and private sectors in countries around the world,” said Element AI CEO, JF Gagné. “Nonetheless, the supply does not yet come close to meeting the demand, and our survey indicates just how far we have to go, given how little top talent there is out there in the world,” he stated.